I first encountered the bleach-blonde Peesh a few weeks ago when his band LoGOz were the token Punk band at a Mod-Ska-Punk Festival. Even when played at 110mph it was evident that they/he had a way with words and a melody. Afterwards a mutual friend told me about a challenge he’d set himself to write and record a new acoustic song every week during 2015. I raised my eyebrows; as you do, but was told he was culling together the best dozen from the first six months to release as an album. My eyebrows remained in the upwards position; as I’m a firm believer in quality control and a ‘good/great’ song a week would be a hard task for even the most professional of Music Row songwriters. Any-hoo the album arrived last week and out of courtesy I gave it a quick listen. Well you can blow me down with a feather – the quality of the 13 songs here have kept it in the CD player to the detriment of several releases from far more established acts. The album opens with New Years Revolution; oddly enough song #1 in the project. 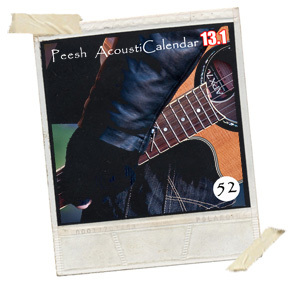 Peesh’s guitar playing is as powerful and feisty as his lyrics yet his voice and melody actually make the track quite radio-friendly. Although I was never a Punk; many of my friends were (are?) so Old Punks Never Die made me smile from start to finish. Obviously Peesh must know several of my mates; perhaps I even know his Dad; but the sentiment he passionately gets across will put a twinkle into many music fans eyes. Occasionally the songwriter can be a bit over-simplistic in his subject matter – Kick Out The Negatives is a prime example; but it’s obvious his heart is in the right place. When Peesh is on form he’s truly on fire; and with songs like The Night Before The Morning After and later Riot on the Radio his way with words is as good as I’ve heard in years; proving there is talent waiting in the shadows. My favourite track here; and one I’ve put on a ‘Summertime CD’ for my wife, is The Death of the 7” Single. From the punchy guitar playing through the heartfelt vocals and a melody Billy Bragg would sell his Granny for, Peesh keeps hitting nails on the head with each rye and humorous observation in every verse. I doubt there’s a music fan between the ages of 35 and 70 who won’t nod their heads and sing along every time they hear it. I can’t recommend this album highly enough; yet fear that if a big Record Company were to discover Peesh because of my review they would want to turn him into the new Ed Sheeran when what the world needs is a 21st Century Billy Bragg; which is what he is! !